Photo by Carl Socolow '77. Dickinson’s Kline Center addition has been named a 2017 Facility of Merit by Athletic Business, a magazine devoted to the sports industry. 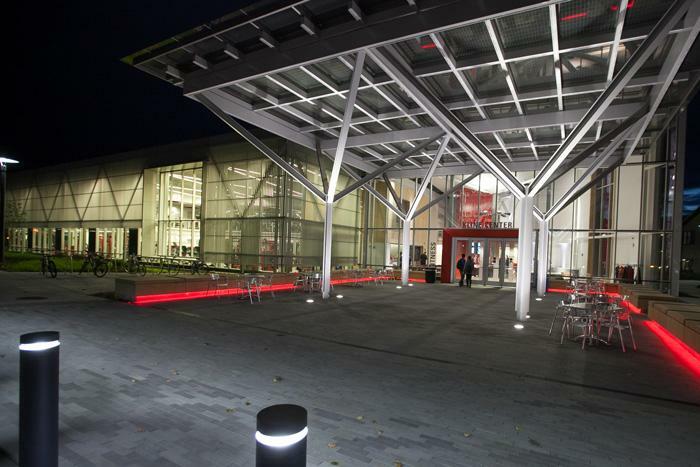 The addition, built in 2014, is home to state-of-the-art training and competition facilities for Red Devil athletics and Dickinson students. The judges commented on the 29,000-square-foot building’s “exceptional detailing,” noting that its exterior exercise space, for example, is a “creative way to engage in alternative fitness programs.” The magazine further touted access to “squash courts, an outdoor basketball court, fitness testing and a healthy-living juice bar” in the facility students simply call "the Kline." In 2016, Athletic Business also featured the Kline Center on the cover of its annual “Architectural Showcase” issue. The center has earned a number of other accolades, including awards from the American Institute of Architects and the Central Pennsylvania Chapter of the U.S. Green Building Council.